(Nevada State Railroad Museum) Nevada State Railroad Museum recently acquired this Amtrak EMD SDP40-F locomotive. It is the lone survivor of its type and will be restored to Santa Fe Railroad's freight train colors. Randy Hees, director of the museum, said an Amtrak EMD SDP40-F, No. 644, and Amtrak EMD F40, No. 231, came to the museum Friday and will be integral parts of its expansion. “As the museum expands, we will want to display more things,” he said. The locomotives are the first pieces of equipment to arrive at the museum on their own wheels since 1993. This was made possible by the new bridge over Interstate 11, Hees said. He has been working with the owners of the locomotives for about a year-and-a-half to get them to Boulder City. Among the challenges was getting permission for them to travel on tracks owned by the city of Henderson. Formerly owned by Amtrak, the locomotives came to the museum from Dynamic Rail Preservation, a nonprofit group formed by four avid railroad fans. They were originally housed at the Portland Oregon Brooklyn Roundhouse but were displaced when the facility relocated. 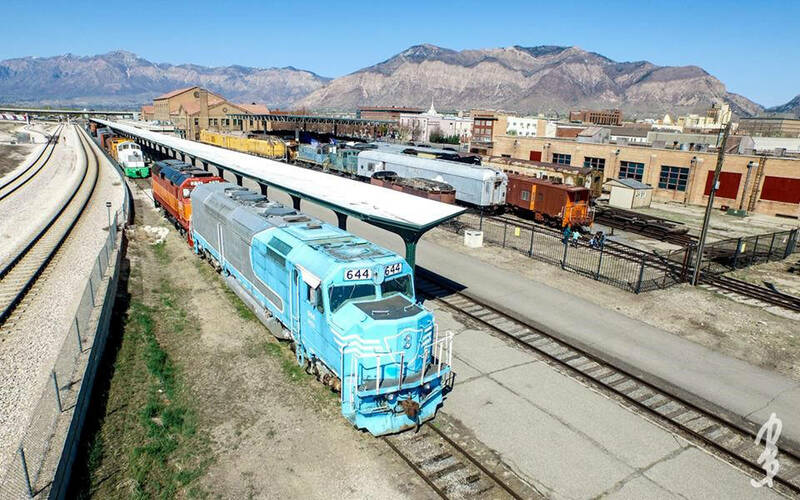 The engines were moved to a historic site in Odgen, Utah, until recently. According to Hees, the trains needed to “disappear soon,” as plans are being made to mark the 150th anniversary of the transcontinental railroad. The Nevada State Railroad Museum was an ideal location because it has room for the locomotives to park as well as access to a shop for repairs, rehabilitation and restoration. At the moment, neither of the locomotives will be used on rides offered by the Nevada Southern Railway, though Hees said they probably could be “jump-started.” They do need to go through the regulatory process before they can be put into action. Both pieces have ties to Nevada, a key factor in putting them on display at the museum. Engine 231 was used by Amtrak for its Desert Wind run between Las Vegas and Los Angeles. Engine 644, the lone survivor of its type, hauled freight through Nevada along the Interstate 80 corridor. Engine 231 also was used in Operation Lifesaver, an educational program started in 1972 to promote safety on railroad tracks and at crossings. Hees said one of the museum’s volunteers also is a volunteer with the program and a trained educator. Engine 644 was one of the first locomotives Amtrak purchased, but it was not a success, Hees said. It was supposed to find a second life hauling freight if Amtrak itself didn’t succeed, but the locomotive was top-heavy because of water storage in the roof for steam heat and prone to derailing. Hees said 132 were manufactured and all but 18 were returned and scrapped. The Santa Fe Railroad removed the water tanks, rebuilt the engines and used them along the Interstate 80 corridor. Engine 644 was painted blue and silver for public appearances after it was retired. It never operated in this color scheme, and Dynamic Rail Preservation intended to restore it to Santa Fe’s freight colors. Hees said Engine No. 231 was built in 1977 with parts salvaged from another locomotive and put into service hauling passengers along a variety of West Coast routes, as well as trips on the Empire Builder, Michigan and Missouri corridor trains, Crescent and California Zephyr routes. It was retired in October 2001 and painted in Amtrak’s orange, red and black “daylight” colors. One of three preserved Amtrak F40 locomotives, Engine 231 has had substantial body work and received a new turbo charger. Dynamic Railroad Preservation intends to repaint the engine in Amtrak colors. Hees said the engine is about the same size as the museum’s primary locomotive and would be good for excursions. According to Hees, the locomotives are the first two of seven or eight pieces the museum will acquire this year. Also set to join the collection is one of the original dump cars that was used to build Hoover Dam. For the time being, he said, there will be challenges finding parking places to display the new exhibits, but space for the valuable additions will be created as the museum expands.